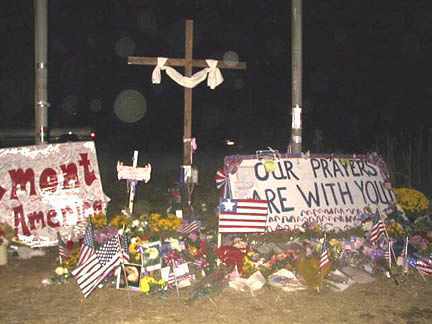 Photograph taken at the public memorial that was created soon after United Flight 93 crashed into the rural field in Shanksville, Pennsylvania. Mysterious translucent spheres cluster around the cross. Photograph © 2001 by Debbie Harris. February 2, 2002 Shanksville, Pennsylvania - After September 11, 2001, the nation heard about cell phone calls from some of the passengers on United Flight 93 to loved ones, warning that terrorists had taken over the plane. One man told his wife that he and others were going to take action against the terrorists. Next PostNext United States Nuclear Power Plant Security – Is It Effective Against Terrorists?